I always yearn for a warm bowl of Curry Laksa during the colder weather seasons. 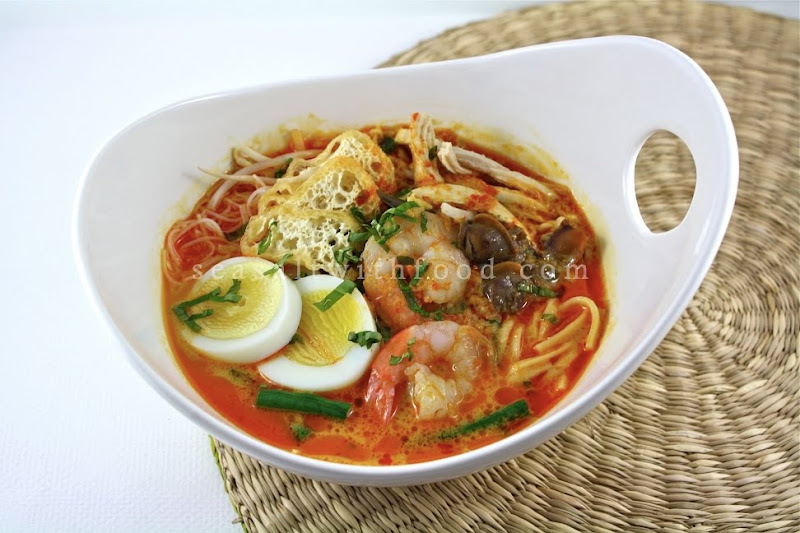 There are many varieties of Laksa in Malaysia; but, I still feel curry laksa is the most popular as compared to Asam Laksa, Laksa Kedah, Sarawak Laksa, and many more. Curry Laksa is a coconut based soup that’s infused with a variety of spices such as chili, galangal, turmeric, shallots, and pandanus leaves to fragrant the soup. 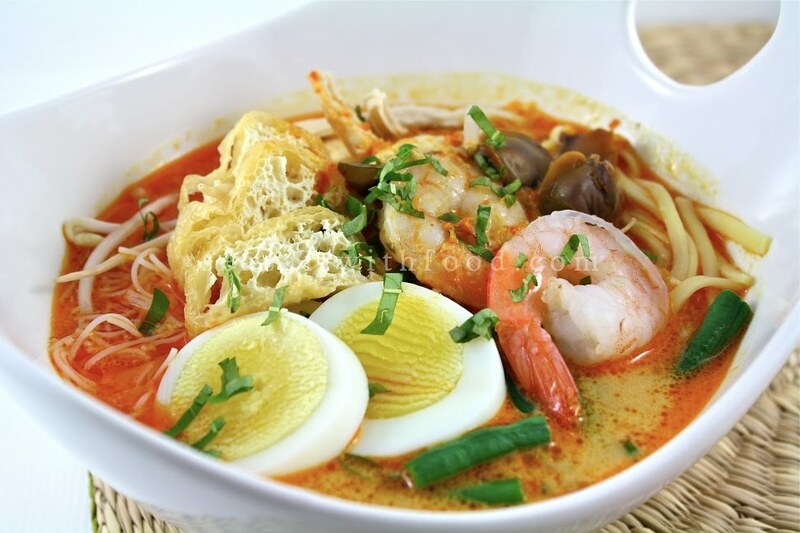 Throw in some noodles, bean sprouts, chicken, prawns, tofu puffs, eggs, cockles, and you have another great comfort food from Malaysia! Grind the spice paste ingredients in a blender or food processor. In a large stockpot over low heat, add the oil and cook the spice paste until fragrant, stirring continuously. Then mix in the curry leaves, lemongrass, pandan leaves and continue to stir the paste for another minute. Pour in the coconut milk and water into the spice paste mixture. Bring the mixture to a boil, lower the heat and simmer for about 35 – 40 minutes. Then add the tofu puffs and let it cook for another 2 – 3 minutes. Season the soup with sea salt. To serve, place some noodles or vermicelli into a large bowl. Then top it with some bean sprouts, long beans, chicken, prawns, eggs, and cockles, if using. Then ladle the hot soup with a few tofu puffs onto the bowl and sprinkle with some laksa leaves, if desired. What a gorgeous bowl of goodness!! wow, you really do make the curry paste from scratch, usually i buy it in packaged form cuz i can't really find the relevant ingredients here in uk. but am still saving up your recipe for future reference. thanks. I'm not sure what candlenuts are but I've been wanting to try curry laksa for a long time. This looks fabulous! @Ju (The Little Teochew) Thanks. @Xialu @ Bittersweets: You can use Macadamia nuts instead of candlenut. I've been looking for a good Curry Laksa recipe for a while now and I think I've finally found it. I'm with you -- there is something about these cold weather days that always has me yearning for a bowl of warm (oftentimes spicy) soup. I CANT WAIT to try this. Comforting indeed. Thanks for sharing. 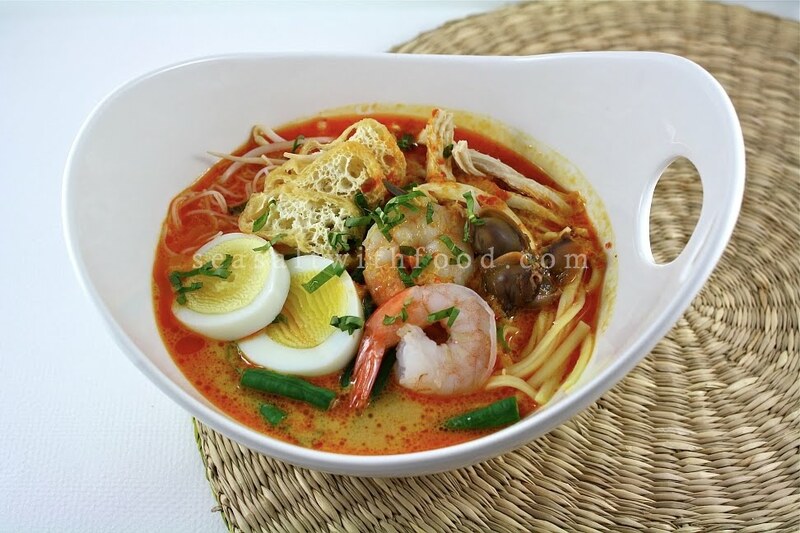 That's such a delicious bowl of curry laksa. I badly need that now to keep me warm. Miss it a lot. Thanks for sharing. @ Mel: I bought the frozen cockles from Chinatown. The shop's name is Wong Xin market and they are located at 747 Gore Ave.